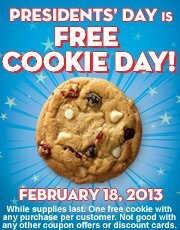 Monday is Free Cookie Day at Subway. While supply lasts, stop by and pick up your free cookie with lunch (or any time of day). No coupon required, but you can RSVP on their Facebook page.